The Maverick Volleyball Club is a registered non-profit sports organization that has been administered by volunteers since its modest launch in 1985. 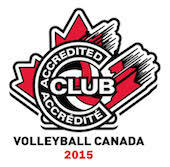 It is currently the largest volleyball club in Canada and we feel that is due, in great part, to our commitment to creating a growth environment for both players and coaches alike. Your sponsorship can help reduce costs to parents while enabling us to fund coaching development sessions and other player-growth initiatives that will continue to strengthen the foundation for success that we are so proud of offering to volleyball enthusiasts. For player- or team-specific sponsorship opportunities, please visit our sponsorship page.